Cossimbazar was the chief overseas port in Bengal from the 16th to the 18th centuries and as a result, all the different European nations who traded with India had a factory in the town. By the close of the 17th century the English factory, depicted in this drawing, was a highly profitable enterprise. The factory owed much of its wealth to its location, near Murshidabad, and to the efficiency of the Commercial Agent and Chief who ran the factory. Its position as chief overseas port in Bengal was surpassed by Calcutta at the end of the 18th century and the town began to decline. 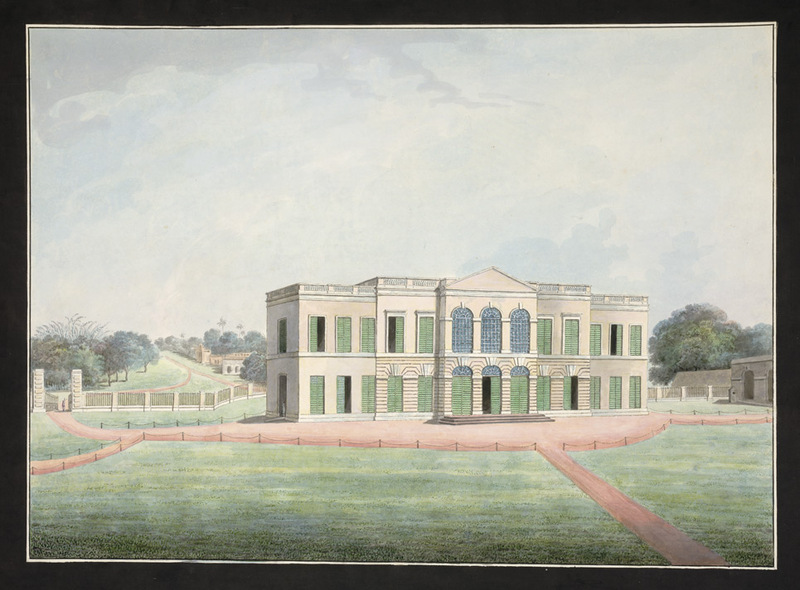 Watercolour of the rear view of the East India Company’s Factory at Cossimbazar in West Bengal by an anonymous artist working in the Murshidabad style, part of the Hyde Collection, c.1795. Inscribed on back in ink: ‘North view of the Cossimbuzar Factory House.’. This entry was posted in Company Rule, Defence, Factories, Military Installations and tagged British East India Company, buildings, cossimbazar, East India Company, factory, factory buildings, factory house, industrial buildings, industries, overseas port, port.